Date Night ventures into uncharted waters, Cabbagetown. 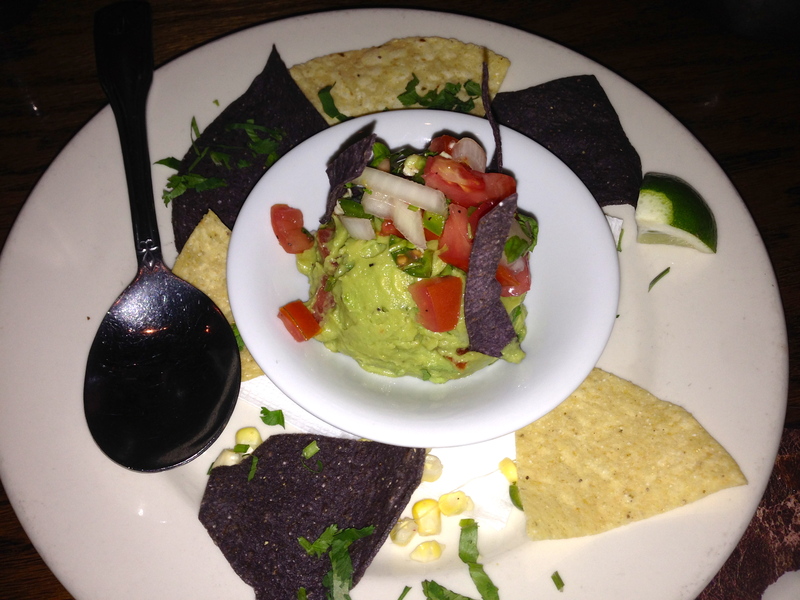 Our friend Natalie told us we must give Agave a try. It’s been here since 2000, and from what we can tell, the crowds are still excited about the southwestern food being served just down the street from the newly-painted Boulevard tunnel. Agave is located across from the historic Oakland Cemetery, near the old Fulton Bag and Cotton Mill, which is now trendy lofts. The building was built in 1920 as the general store for the factory town that sprung up around the mill. You can still see the old brick in the walls inside. Nice touch. 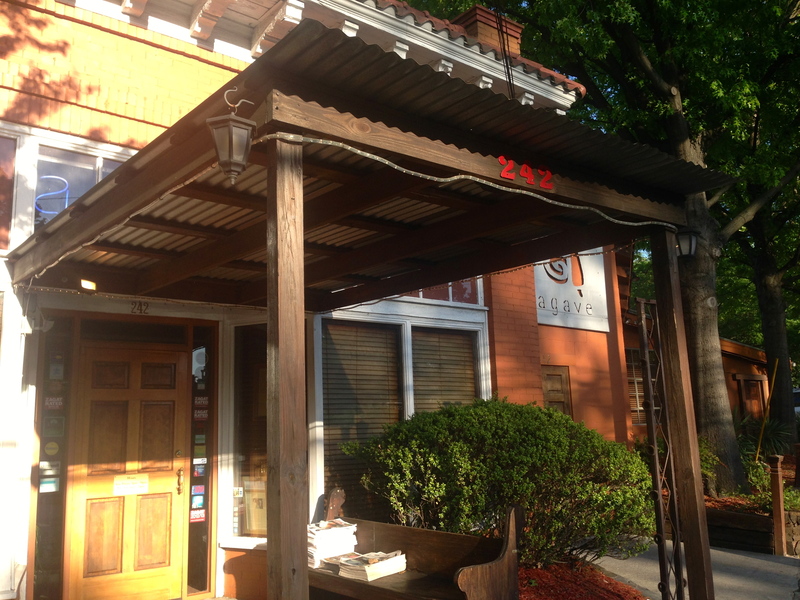 We arrive around 5:30 without a reservation and are seated right away by the friendly staff. The bar is right up front. Evidently if you sit here between 5-7PM, you get two-for-one appetizers. 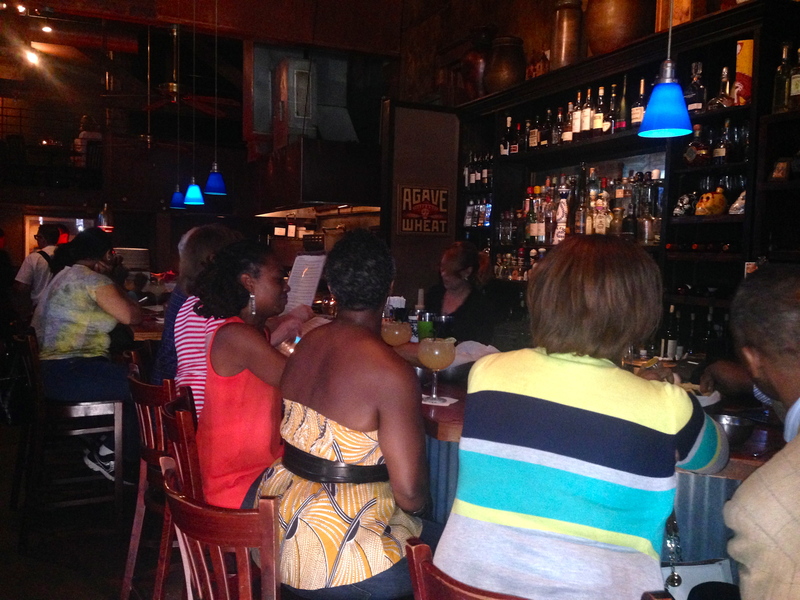 The bar is crowded and we opt for a table so that we can pay full price. The large kitchen juts out into the dining room. They are serving a lot of people tonight and they have their act together. 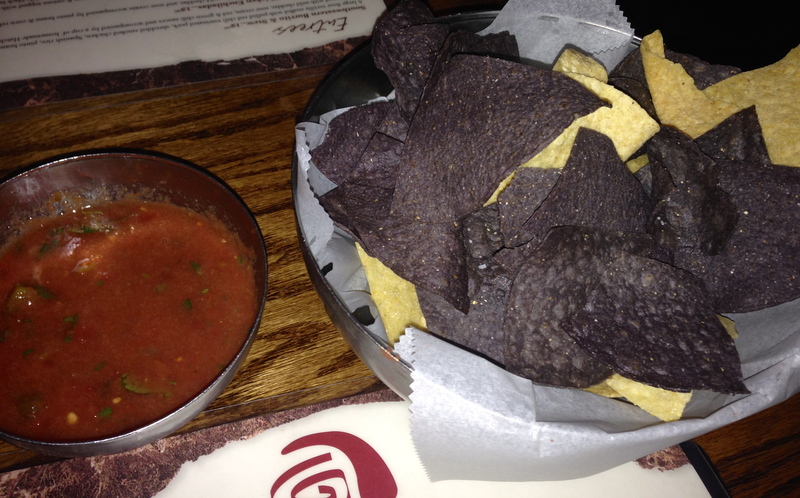 We are greeted with a bowl of hot, crisp and slightly-salty tortilla chips. These aren’t just warm, they are piping hot, but quickly cool down. This will not be our first bowl of chips tonight. The salsa is not too spicy. The heat content is just right for us. With the warmer weather, Date Night is moving into lighter beers. We are leaving winter’s darks for spring’s wheats and IPAs. 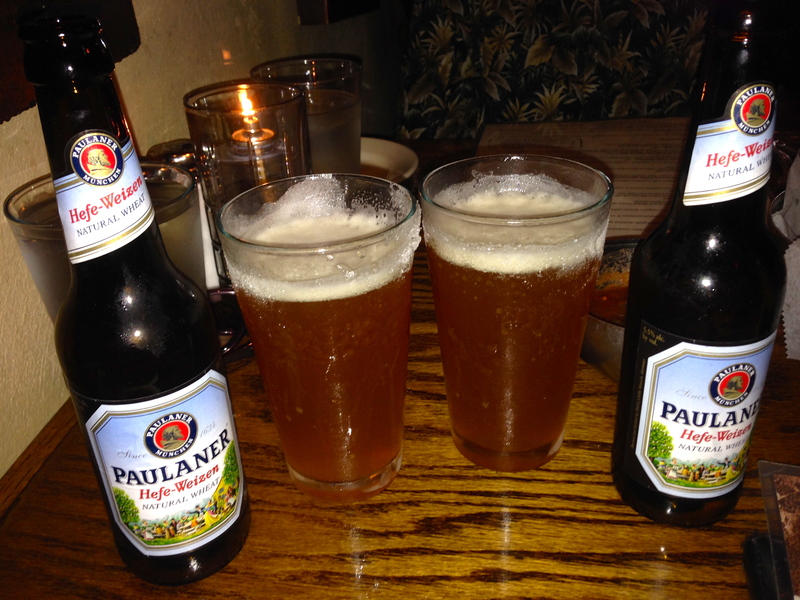 One we happen to enjoy is the Paulaner hefeweizen, a wheat beer from Germany. This comes in a frozen glass. With a name like Agave, you can expect a huge tequila and margarita menu that Jimmy Buffett fans are certain to enjoy. There is also a very large wine list for our oenophile friends. 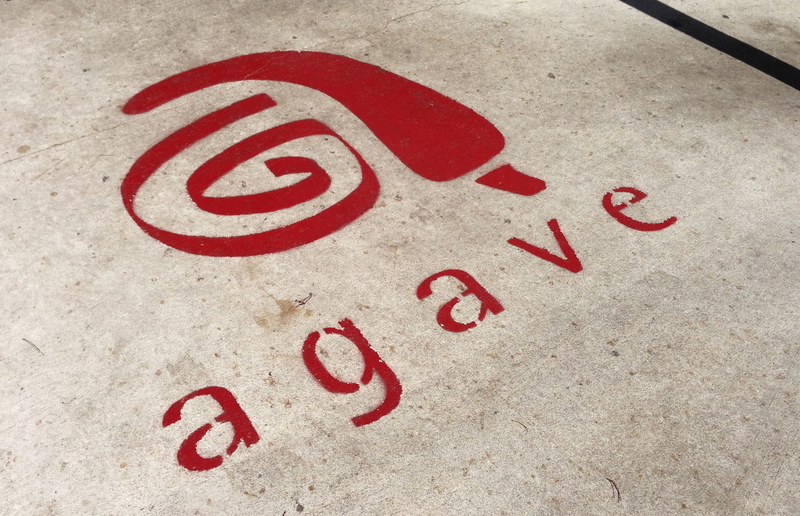 Online reviews rave about Agave’s guacamole, and we investigate for ourselves. It’s excellent, with the strong taste of avocado and not too spicy. This is a half-order, which you can double for larger tables. There is a large “starter” portion of the menu, which you could order as a small plate if you aren’t that hungry. There are tacos, stews, enchiladas and quesadillas on this part of the menu. 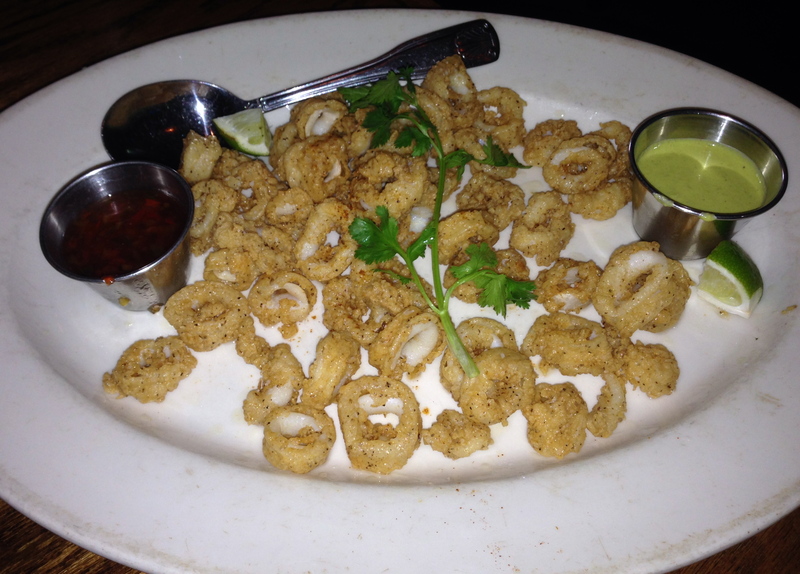 We probably should have ordered something southwestern, but we go for an appetizer staple (no matter what the cuisine), the calamari. It comes right out of the fryer and to our table, covered with a buttermilk and cayenne batter. We thought the sauces would be too spicy for us, but they are not. The green one is a jalapeño sauce that tastes like a spicy guacamole and the red one is full of habanero and poblano. There’s something sweet in there too, which takes away some of the habanero heat. Both sauces go well with the calamari. There are 22 entrees on the menu, seven of them in the vegetarian section. That’s a big variety, and we have trouble choosing. We are all set to order the beer-braised pork shank (they had me at beer-braised) when we see an order of this get delivered to a nearby table. It’s the stuffed mountain trout tomatillo. 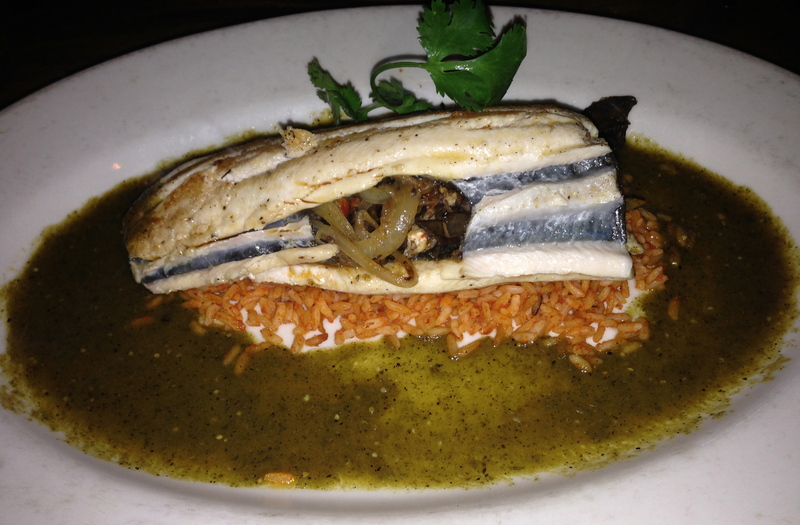 The Georgia trout is stuffed with crawfish, mushrooms, and onions and served over Spanish rice. The tomatillo sauce on the plate adds a little spice to the dish. This is a large order that you can share with your date. The trout is crispy on the outside and moist on the inside. The stuffing is excellent and ties it all together, making this dish visually as well as orally pleasing. After all of the chips, small plates and large entree, we are pretty full. That doesn’t stop us from ordering dessert. The same table that orders the trout gets an order of the spicy peanut butter pie. We really should mind our own business. 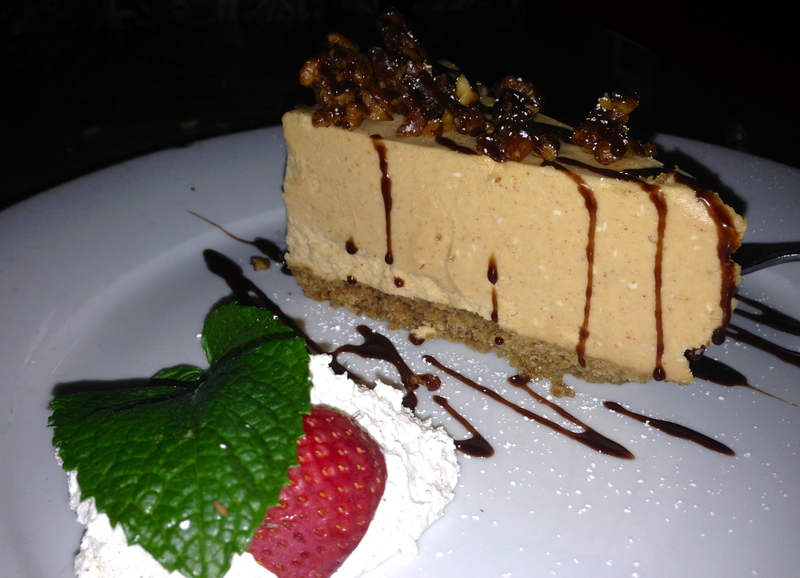 Peanut butter mousse is served over a graham cracker crust with spicy pecans on the top. The mousse has the consistency of cheesecake. The pecans are some of the spiciest food we eat tonight. Make sure you get some of that whipped cream on your fork to cool down your mouth. 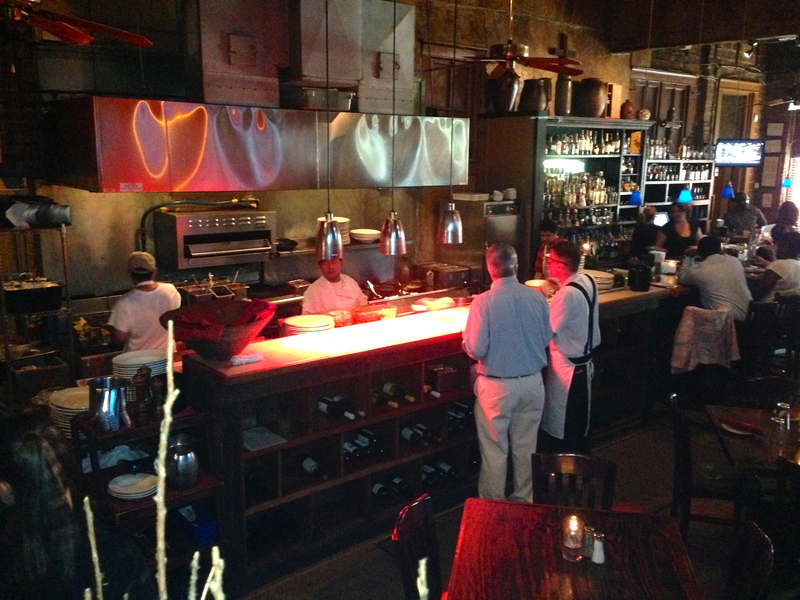 The bottom line on Agave: Loved it. The food and service are top-notch. A shout-out to our server Molly, who knew her menu and steered us in the right direction. 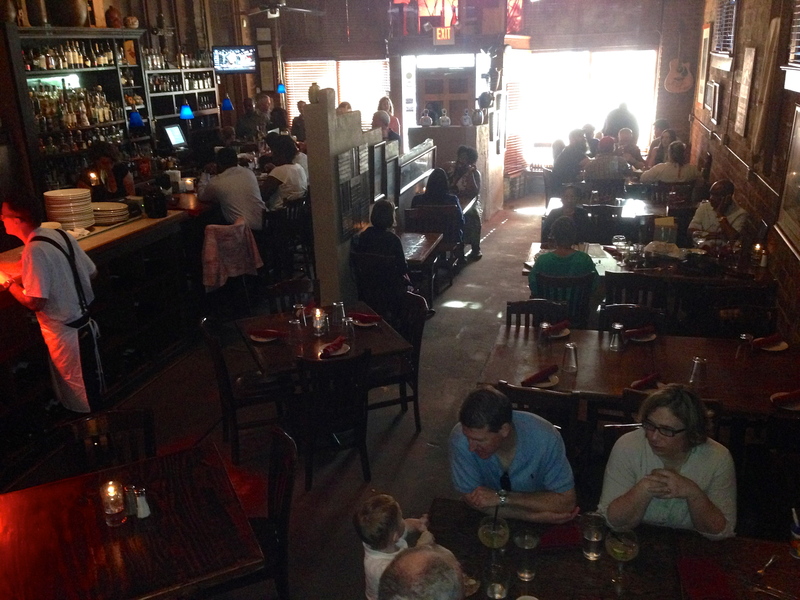 Agave is noisy, but a fun place for a date. Those old brick walls reflect the sound and make it hard to hear conversations at normal volume. You will need a reservation if you go past 6:30PM as it gets crowded. The valet parking next door is free and the best option to find a space. If you can ever get a seat at the bR for happy hour, order the two for one fried lobster tails. Unbelievable! It’s also fun to watch the kitchen work; those guys are PROS.